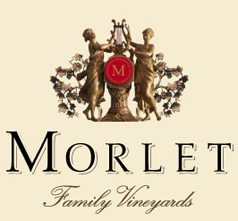 Highly acclaimed by Robert Parker, Steven Tanzer, and Wine Spectator as “Must Haves” and already reaching cult status in the California market, Morlet Family Vineyards is the project of well known winemaker Luc Morlet. Luc Morlet is a fourth-generation, France-born winemaker who grew up on his family’s domaine in Champagne. He worked in vineyards and wineries in Burgundy and Bordeaux before making his way to California. There he has served as winemaker for Newton, Staglin and Peter Michael Winery, where he is still consulting winemaker to his brother Nicolas, who has succeeded him as full-time winemaker. In 2006, Morlet and his wife, Jodie, founded Morlet Family Vineyards, which focuses on small lots of wine from Napa and Sonoma, crafted in a rich and creamy style.